One of the things I force my students to pay attention to (some resist) is the concept of storyboarding out their science-based video game projects. But I know, from experience, how important it is to have a map forward, even if you abandon the map along the way for more creative terrain. 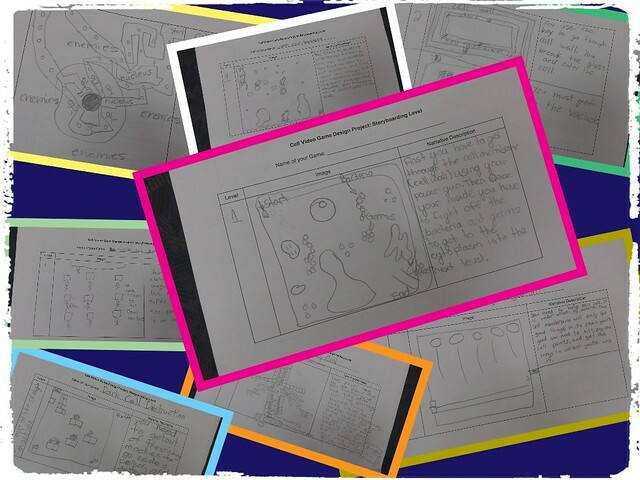 As a teacher, the storyboard also provides me with a way to see what they are thinking as they begin the design phase, as well as gives us discussion points on which to talk through the game design, science concepts and story ideas in a workshop-style mode. You can read more about what I wrote about storyboarding, including the sharing of resources, over at the Gamestar Mechanic teacher site, from a few years ago. I’ve come to call this the “storyframe” of the video game (rhyming is helpful technique). The story is the narrative wrapper in which the game play itself is situated. Of all the elements of our game design, this is one of the trickiest for my students. First of all, there are the confines of Gamestar Mechanic, which allows text in the title of the start of the game and at every level, but not a whole lot of room. 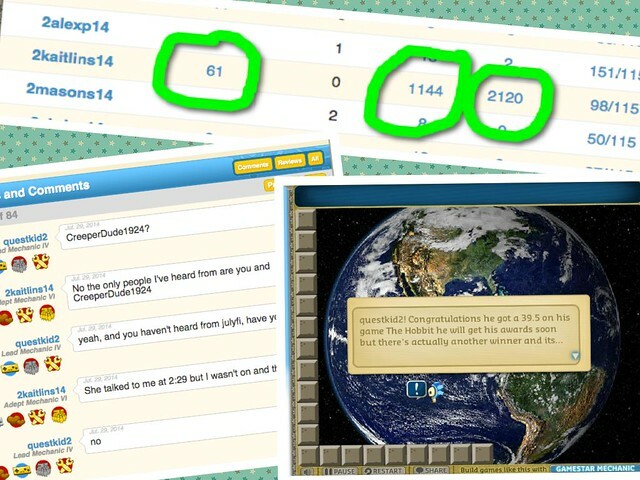 Students can earn message blocks, which are handy, and they can earn some sprites that “talk” (via text messages). What must occur is the use of metaphor (this represents that), focused narrative text that moves the player/reader along on their journey through the game system, and a sense of flow. That’s a lot to ask for from a sixth grader, but they can do it. It does require me to be conferencing a lot, reminding them of what good games do (and how to make a game better), and feedback from peers during the initial stages of design. You know what the best resource is for this discussion around storyframes? The Magic School Bus series. No one did it better, particularly when we talk about science and storytelling. And, what franchise effectively jumped across mediums so well? From picture books to television show to video games, The Magic School Bus showed how transmedia can work. Building that kind of story? Well, that’s what my students are in the midst in right now. You’d think with all the video game design work I do with my students that I would have already been kneedeep into Minecraft. My students certainly are. Me? Not much. No real reason except time to dive in always slips away from me, but now that my youngest son is using and loving Minecraft (and even joined a Minecraft club at our public library), I figured it was time to dip my toes into the blocks, so to speak. 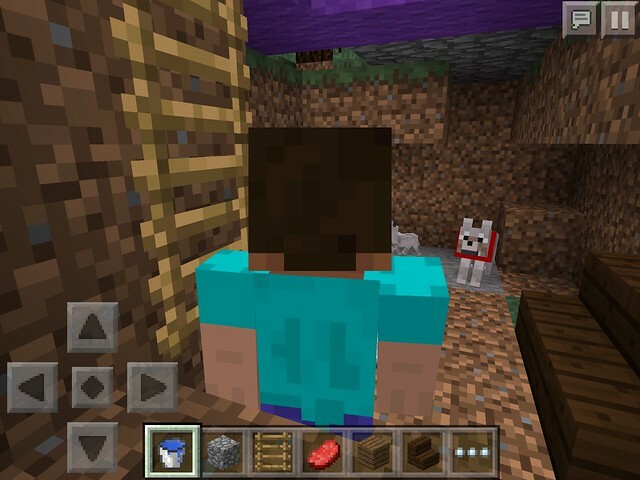 So, I asked my son, teach me Minecraft. OK, so now I get a bit of the appeal of Minecraft. I was never quite oblivious to it but I can see how the building and wandering in the world is a pretty fascinating experience. I spent some time “flying” high above the world, watching the contours being drawn out in each direction. That was pretty nifty, to think we were in the map as it was being made. And the dogs seemed pretty happy. We don’t spend every teaching/learning moment doing game design, but I suspect that might be the impression some folks get if they read my blog. We do a lot of other kinds of writing and reading activities. And we are not always on the computer either. One of the ways I introduce and reinforce game design elements is through hacking of other games. Some years, we hack chess. 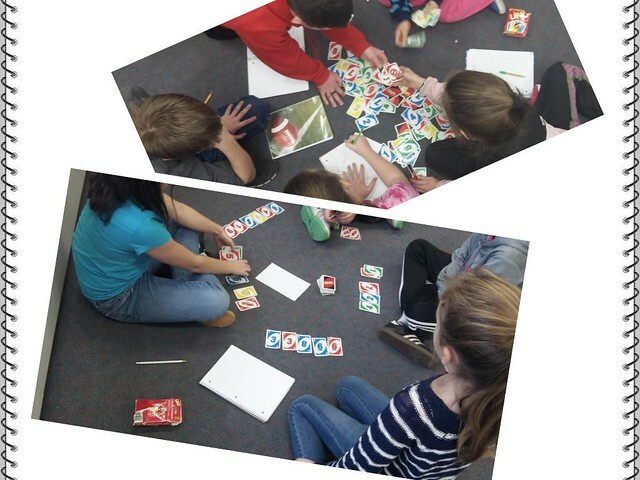 This year, I pulled out my decks of UNO cards, and over a series of days (which sometimes are far and few between as we do other things), my students have been redesigning the game of UNO. The supplies are simple: a deck of UNO cards. But I did introduce the game variable of dice one day, which led to interesting discussions in the groups about whether dice would improve their concept or not. Most have not used the dice, even though they were all excited about it. They have been working on finalizing the Rules of Play for their hacked card games, and one of these days, I will separate each group and reform them in a Jigsaw Activity, so that every new group has three to four new games to play, with an “expert” from the original groups to teach their classmates. We then use the UNO game development as points of discussion when we shift into our Science-based Video Game Project, now underway. Hacking UNO provides for collaborative discussions on game design, and creativity, and collaborative writing, while also connecting nicely to the larger project now underway. 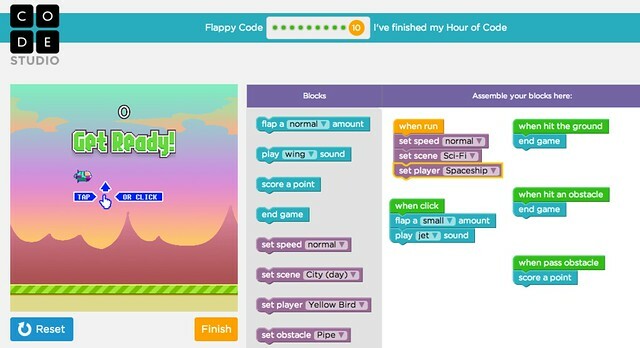 One of the many great activities that are included at the Hour of Code site (and there are many) is learning how to program/code your own Flappy Bird-style app game. You can even share it out for others play after you learn and make your own game. You can even remix my game and make your own. How cool is that, eh? My son also made his own version — Flappy Santa — and was very engaged and had to do some problem-solving. But he found success and when he learned he could publish it for others to play, he was highly motivated. This book — Gaming the System: Designing with Gamestar Mechanic — could not have arrived at a better time. I am knee-deep in our science-based video game design project right now, and while I have done gaming for a few years now and have a pretty solid handle on it, this look at game design through the lens of systems provides me with a fresh insight into the learning that is going on each day in my classroom. The book is part of a series put out by MIT Press called INTERCONNECTIONS: Understanding Systems Through Digital Design. There was a NWP Blogtalk radio show with the writers/editors that is worth checking out. I should note that I was an early reader of another book in this series, and received a free version of that book for my time and effort. But I did not read this one on gaming and bought for it myself. Also, the National Writing Project is one of the partners in the putting together the series, so I do know some of the folks involved. This book, while somewhat pricey for a cash-strapped teacher, gives a powerful look at the potential of game design, connections to literacy and science standards, and plays out like a how-to guide for getting started and how to push kids further into complex thinking. It references Gamestar Mechanic as its base of game design (a site which I also use) and includes numerous screenshots, handouts, reference sheets and lesson plan ideas for implementing gaming in a constructivist approach. And all of this is done through the lens of “systems,” which is a conceptual frame of thinking of the whole being a sum of its parts, and how changes in one part of the system change the whole. Think of weather patterns. Or political maps. Or airports. Or manufacturing. While those are pretty advanced systems to consider for young people, game design makes it real by bringing them into a system they understand, and showing how a designer’s intentional approach changes the system of the game. It’s a brilliant approach, really, and I realize now that I have been teaching Systems withou quite realizing it, and without using some of the domain specific vocabulary that I now have in my pocket for our work in the classroom. I’ve bookmarked a fair number of pages in my copy of Gaming the System, and I intend to share it with my science colleague (whom is my partner in our game design project) and if my new principal walks in for an observation and wonders why everyone is playing video games in ELA class, I have some materials to help me make my case about the value of our science-based video game design project. There’s a caveat to this post: my sixth graders have only just started the design stage of a science-based video game project. But I have already introduced them to the possibility of submitting their final video games (still a few weeks away from completion) to the National STEM Video Game Challenge. Among other things, I am trying to help my students see an audience much larger than our classroom and to view their project as something with more potential than just a grade from me for the work they do. I want them to be creating a piece of digital work for the world. Sure, it might be that the potential rewards and recognition is what interests them in this kind of video game design challenge. That’s OK. Extrinsic rewards can provide a path to intrinsic rewards, and I am already noticing a deep consideration of story, game design, quality and science as they begin moving from brainstorming and storyboarding into the design phase of their game projects on Gamestar Mechanic (which is a partner with the video challenge, meaning students can submit games into the STEM Video Game Challenge right through Gamestar, which makes things a bit easier on our end). 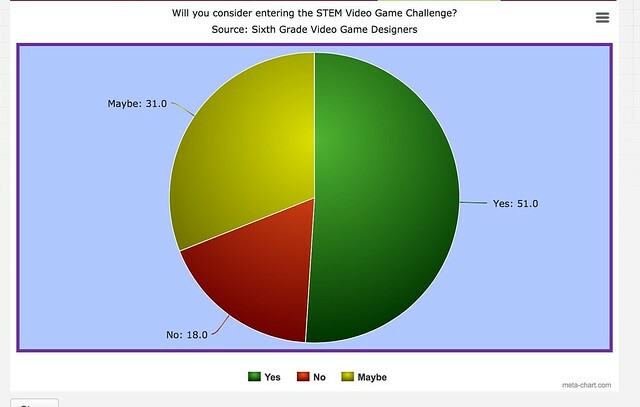 This graph shows the results of a question as part of the brainstorming process: Would you be interested in submitting your science-based game to the STEM Video Game Challenge? I am pleased at how many are considering that option (with the understanding that anyone can change their mind later on). 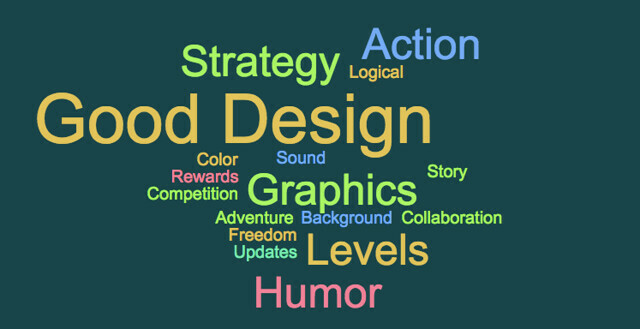 As they begin designing their own science-based video games in the coming days, we will be referring back to these word clouds as a guide for them to remember what makes a game good and what potentially makes a game boring. Interestingly, this is the first year that advertising and in-app purchases became part of our conversations. 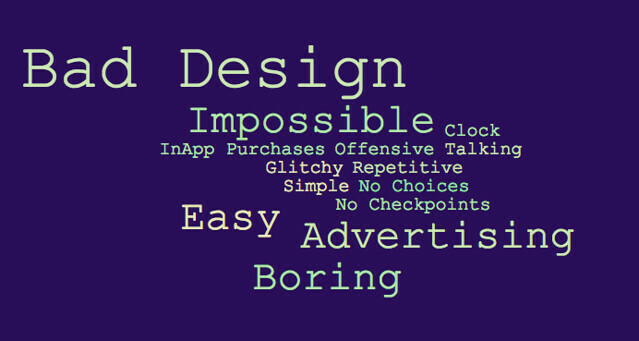 Most were annoyed about the “free” entry to a game, only to be confronted by pop-up ads or in-app purchases needed to move to another level or gain some new tools. That led to a discussion about “business models” and a reminder that non-tech games don’t have those intrusions. They were standing in line, waiting to put the laptops back on the computer cart. We’d been gaming in the classroom, working with Gamestar Mechanic to begin the process of understanding video game design by playing and analyzing games. This week, they will start the initial stages of storyboarding and building their own science-based video games. He spoke that last line as if he walked into a pit of vipers because there was a sudden burst of loud response from the girls. I think I saw a few of his friends shake their heads, knowing what was coming. He seemed a bit shaken by the response. That’s good. I think he got it. I do. And if not, the girls are going to set him straight. Count on that.